Italian Veggie Pizza recipe by Sonia at PakiRecipes.com. 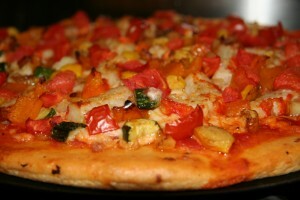 A tasty and healthy pizza that features wonderful vegetables. Add any of your favorite toppings to your pizza (Chicken or meat are optional). On the pizza base, cover it with tomato ketup throughly until covered, place mozarella cheese slices on top until covered, than place your chopped tomatoes, olives and feta cheese. spread more tomato ketchep on top. and finally place another layer of mozarella cheese on top to give it a finished touch, place sliced tomatoes on top. bake for 15-20 min in preheated oven on 350 degrees.